Added almost 7 years ago by DMCZone. Last updated almost 7 years ago. As of almost 7 years ago, DMCZone has indicated that they no longer own this bike. Are those rings different tooth counts? The two sync chainrings on left side are with same tooth count, obviously to keep the two chainsets in sync. The right side chainwheel can be of a different size. i want tor ide this once!!! i wanna know does both riders have the ability to slow the bike down? Both can slow the bike down by not pushing. Sudden de-accelerations are unnecessary on the track anyway. how do u stop this bike? skidding? 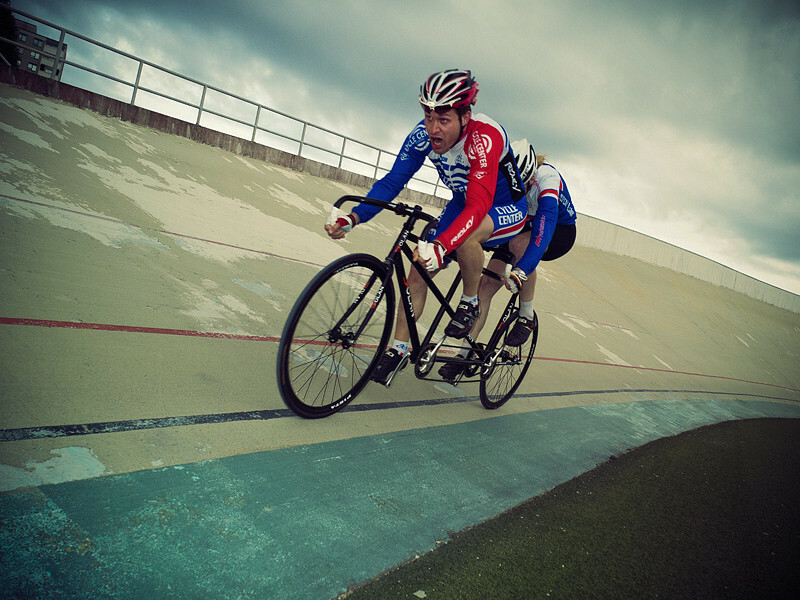 How do you stop any track bike? When you are on the track, you roll to a stop. If it was ridden on the road, then by skidding obviously. This is the true definition of gnarly! Gnarly. I'd be too afraid to ride that thing. holy crap, that's like 250 bucks worth of chains!